A manual on how to meet Invasion XI participants in the US. As part of the Eurolanche Invasion XI, twelve Eurolanche members from Slovakia, the Czech Republic, the United Kingdom, Austria, Poland and Croatia will venture to the US. Each year, American fans ask the participating Eurolanche members for a meeting. This year will be no different and Invasion XI participants will be happy to meet new people and to see well-known faces as well. Since the program of each Invasion is flexible and can change by the hour, it’s really difficult to agree on a specific time and place for a meeting in advance. You should first finish reading this article and in case you’d be interested in a meeting with Eurolanche, contact as at eurolanche@eurolanche.com. Options to meet Eurolanche will be published via Twitter, but due to possible changes, or in order to get more information in advance, we recommend you contact us via the aforementioned email address. Eurolanche members will be in Colorado on February 12; then between February 16 and February 20 and finally between February 25 and February 28. Between February 13 and February 15 the group will spend two and half days in Las Vegas and between February 21 and February 24 the fans will be on a roadtrip in Chicago and Nashville. 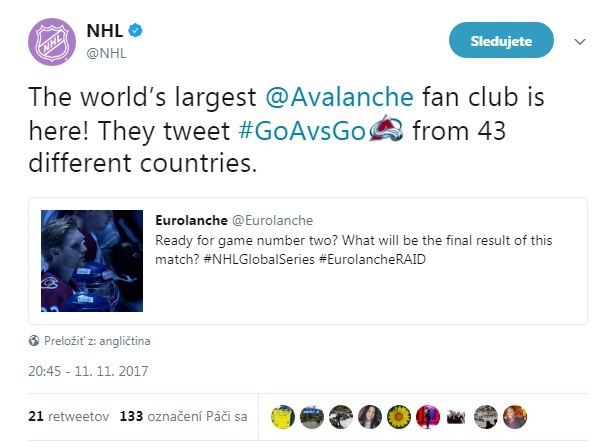 During the group’s stay in Colorado, the best options to meet with American fans will be prior to games, during games at the Pepsi Center, after games, during selected practices at the Family Sports Center and on other days in the evening hours. In case you’re interested in joining the group for one-day trips in Colorado, please contact us at eurolanche@eurolanche.com as soon as possible.